Just a quick post to show a part of my studies for today. 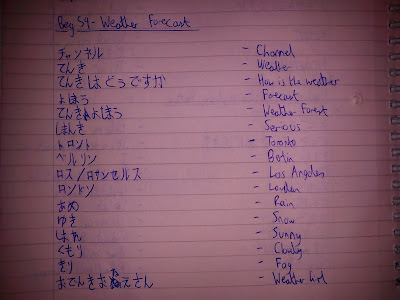 Once again I learnt some new vocabulary with a Japanesepod101 Beginner Lesson, and this lesson was mainly to do with different types of weather. Oddly, i did seem to know most of the vocabulary but did not know the word for 'sunny' (up until now, I had only been able to moan about rain, and not be happy about sun in Japanese lol). I had also tried reading a manga that i bought from one of my friends, called Densha no Otoko (Train Man) that i had been having quite a bit of trouble with mainly due to my Kanji knowledge, but I now seem to be able to read a lot more of the book, so hopefully I will be able to read the whole book in the next few months. p.s. If you cannot read Katakana or Hiragana (or my hand writing ^_^) i may start posting some notes on these writing systems as it is a LOT easier to pick up the language knowing these while learning the vocabulary aswell.